Plus, new system, weapon type, and story content details. 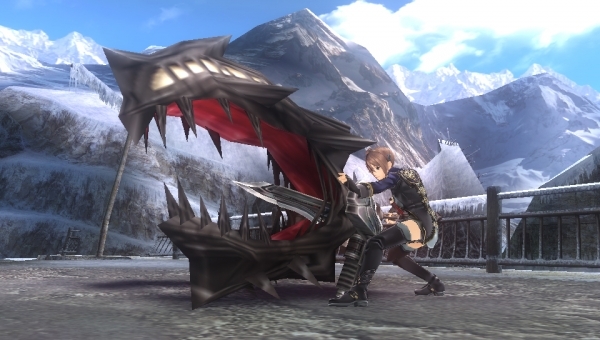 God Eater 2: Rage Burst will launch for PlayStation 4 and PS Vita in Japan this winter, this week’s Famitsu reveals. Additionally, the magazine offers details on a series of new elements being introduced in the updated sequel. Blood Rage is new type of power that can be triggered if players are able to fulfill certain conditions. First, players have to build up a special gauge to 100 percent by attacking enemies. Once that’s been accomplished, players can swear an oath to their God Arcs, promising to do things such as damage Vajra a certain amount or to destroy a specific body part, among other things. Should the conditions of that vow be successfully met within the time allotted, Blood Rage is then finally triggered, the strength granted far exceeding that which can be achieved normally with Aragami Bullets. Naturally, harder vows to fulfill bestow players with better buffs if they manage to fulfill them. While narrative details on the new story content are light for the time being, what is known is that the new segment, the eponymous “Rage Burst” chapter, will feature content split across six different difficulty levels as part of the main questline. A new character by the name of Livie Colette (voiced by Hisako Kanemoto) is also set to appear wielding what’s known as a “Variant Size,” the details of which are below. A new category of melee weapons, Variant Sizes surpass existing weapons in that they have very long reach. Combat with Variant Sizes revolves around playing with attack timing, granting players flexibility in how they approach different situations. We detailed this new Aragami last week.